… is like running in a dream. You have this feeling of running in slow motion with no idea where you are headed or where the end is. Reality checks were necessary while I was running this morning. Today was the first official race of 2014 for both the NYRR and me. After a month of NYRR race hiatus, 6,000 runners gathered in Central Park for the Joe Kleinerman 10k. 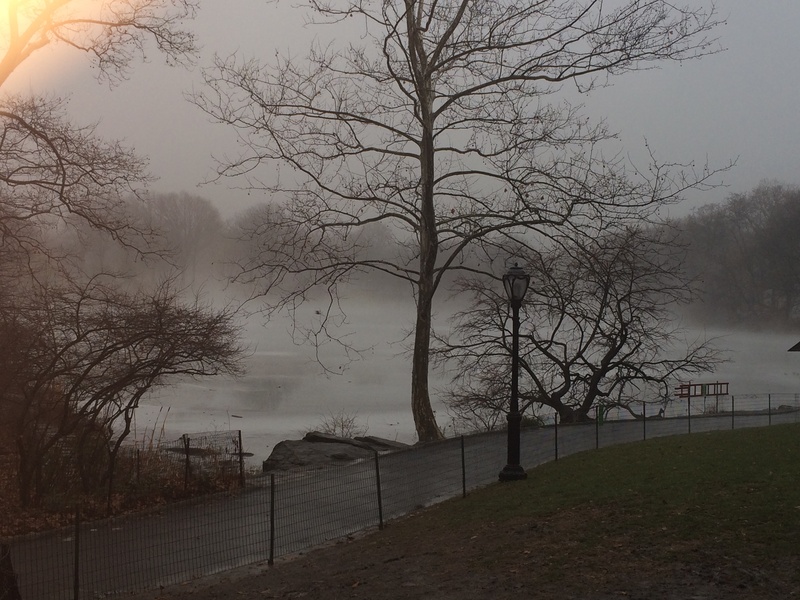 I was alert the first couple of miles and managed the Harlem Hills quite nicely, but as I ran along the west side and around along Central Park South, I was in this sleepy daze due to misty and foggy conditions. On the flip side, running in 93% humidity was great for my skin, nasal passages and lungs. It was like I was at the spa, in a perfectly-temperatured steam room, my skin absorbing as much moisture as it could take. After a week of lost moisture due to absurdly hot classroom conditions, I needed that humidity. I probably should have fueled up with Vitamin Water during the week to account for the excessive loss of fluids, no joke. Complete sauna in my classroom. So today I was pretty thirsty while running because of last week’s “drought”. In any case, I may have felt more mentally in tune with this event had it not been misty or foggy, or me running in an under-hydrated state. Not making excuses – I finished in around my usual time, but man was I “foggy” morning. That’s a beautiful picture! Probably not the best to run in (or drive! ), but pretty to look at. Thanks! The road was still a little slippery in spots but the temps were warm so the air was nice.